Posted 10 June 2014 & filed under 1960s, 1970s, Adelle Stapleton, Life and leisure, Life in other countries, Oral history. 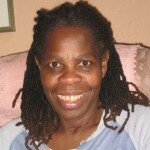 Adelle was born in St Vincent in 1959 and came to St Albans with her parents when she was three years old. The family lived in Berners Drive and she went to St Peter’s school and then St Julian’s Girls school. Adelle share her memories of the Cottonmill swimming baths, scrumping and the local shops.